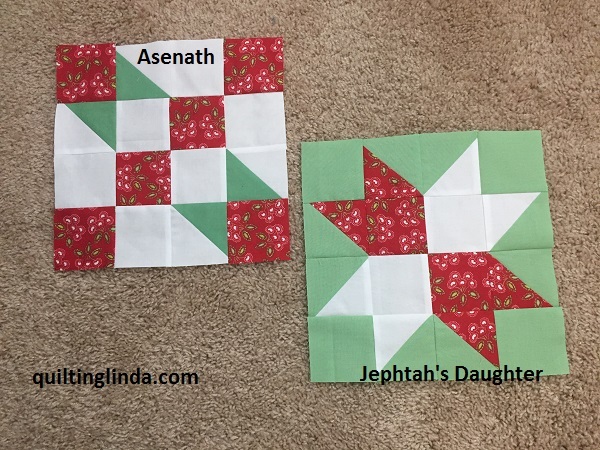 The Women of the Bible blocks this week are Asenath and Jephtah’s Daughter. Asenath was Joseph’s wife and mother of two sons. Her sons became forefathers of two of the twelve tribes of Israel. Jephtah was the son of a prostitute and was an outcast. He became a strong soldier and leader. While in battle, he made a vow to God that he would sacrifice the first person to come out of his house if he would win the battle. He thought that a servant would be the first to greet him but it was his daughter who ran out to meet him. I used the same fabrics in these blocks that I used in the block for Jezebel. I like to use the same fabrics at least three blocks in a quilt top. The next two patterns will be available on May 1 at the Prairie Quilt website. Within you'll find info about quilting, including my projects soon to be featured below, as well as tidbits about my friends & family. Enjoy!